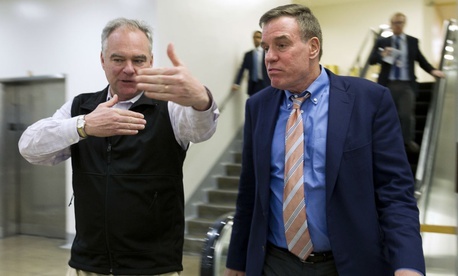 A group of 16 Democratic senators on Thursday expressed “serious concerns” with how some federal agencies have appeared to move forward with implementation of provisions of a series of controversial workforce executive orders, despite a court order barring them from doing so. In August, U.S. District Judge Ketanji Brown Jackson ruled that the key provisions of three executive orders signed by President Trump in May that sought to make it easier to fire federal employees, set time limits on collective bargaining negotiations and set strict limits on how union officials can operate at agencies violated the 1978 Civil Service Reform Act. The Office of Personnel Management then issued guidance ordering agencies to comply with the court order and roll back efforts to implement policies prescribed in the executive orders. But by September, federal employee unions, which had brought the legal challenge to the executive orders, accused several departments of circumventing Jackson’s ruling, continuing to push for the provisions of the orders in collective bargaining negotiations and merely claiming their positions were independent of the presidential edicts. Union officials at the Health and Human Services and Veterans Affairs departments and the Environmental Protection Agency all reported similar actions by management in the bargaining process. In a Nov. 1 letter to acting OPM Director Margaret Weichert, 16 Democratic senators highlighted those allegations, and accused the Trump administration of intentionally “ignoring” the ruling. The senators criticized OPM’s guidance encouraging compliance, calling it vague and lacking details as to how agencies should roll back their implementation of the executive order. OPM did not respond to a request for comment. The district court decision is being appealed by the Trump administration. Last month, a three-judge panel rejected the Justice Department’s request for an expedited schedule in the case. Democrats demanded that Weichert update them on how OPM is working to ensure compliance with the executive orders, whether the agency plans to issue new guidance in light of agencies’ recent actions, and whether the agency has done “any” oversight to ensure compliance with the initial guidance. “in order to ensure good labor relations within the executive branch, and to avoid labor strife, it is of paramount importance that agencies engage in good-faith collective bargaining and adhere to the relevant civil service statutes,” the senators wrote.